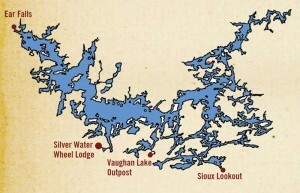 Silver Water Wheel Lodge is located 42 miles north of Dryden on the south central shore of Lac Seul. Access is simple and convenient whether you choose to fly or drive. For specific travel instructions please call. Most of our guests cross the border at International Falls, MN into Ft. Frances. Take Hwy 11 east to Hwy 502 north to Dryden. Travel through Dryden past the paper mill, past Safeway grocery store, over the railroad tracks to the Hwy 17 intersection. Take a left at this set of lights heading west on Hwy 17. At the very next set of lights there is the Dryden GM dealership on the north side of the road and the Ontario Government building across the street from the dealership. Turn north onto the road between the dealership and the government building (Hwy 601). 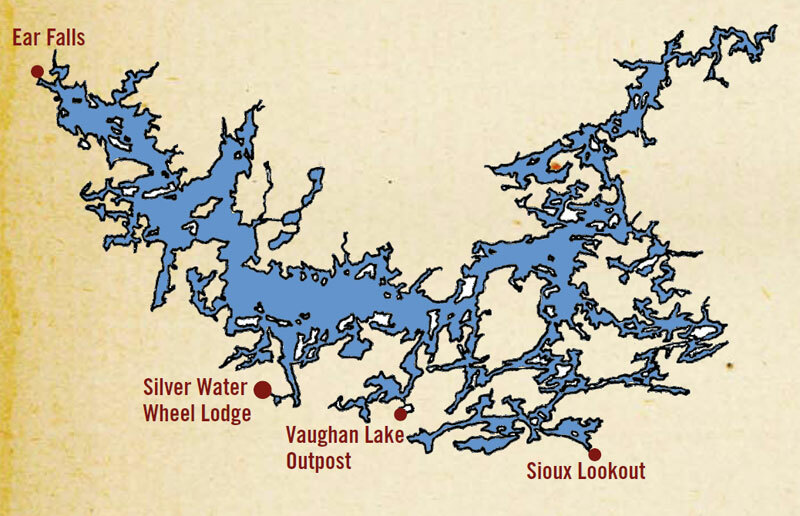 Silver Water Wheel finger board signs will direct you the remaining 42 miles to the lodge. Follow Highway 601 for 6.5 miles until it curves hard to the right. At this point you will follow the gravel road straight ahead. This final stretch is 4.7 miles into the lodge. Expect the trip from Ft. Frances to take you roughly 2 hours to Dryden. 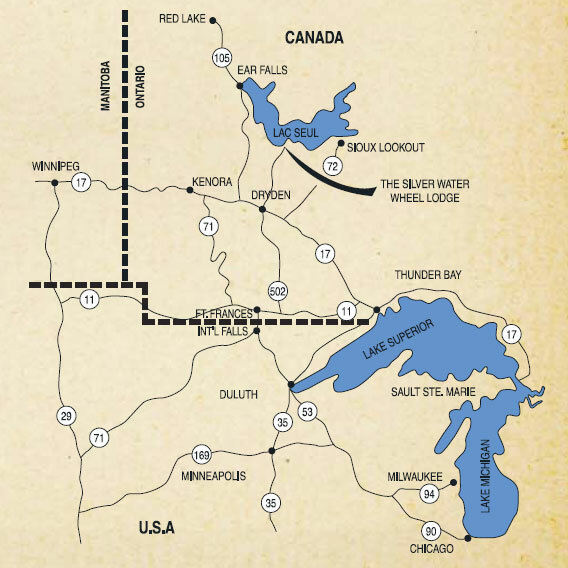 The trip from Dryden to the lodge can range from 1 hour to 1.5 hours depending on the road and the vehicle you are driving. We advise guests driving a car or low setting vehicle to use extra caution as the road is a bit rough. Most of our guests traveling commercial airlines choose one of Northwest Airline’s connections from Minneapolis to International Falls, MN. Rental cars are available at the airport and the remaining drive is a scenic 3 hours.